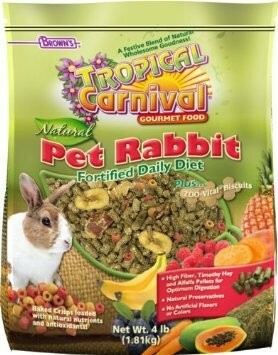 Tropical Carnival® Natural Pet Rabbit Fortified Daily Diet is a vitamin-nutrient-fortified food and treat, all-in-one! This premium gourmet food is specially formulated for the daily dietary needs of Pet Rabbits and is jam-packed with a medley of essential delicacies. 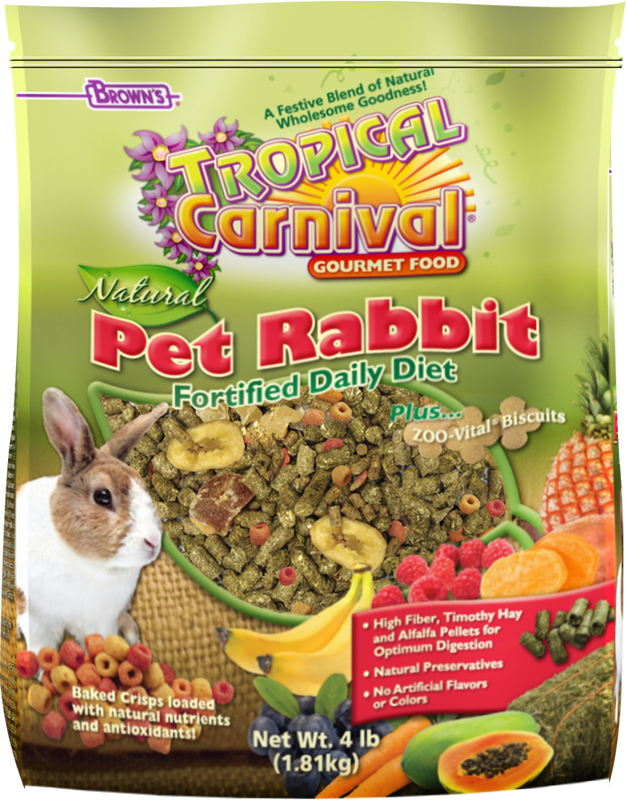 Brown’s® Tropical Carnival® Natural Pet Rabbit Fortified Daily Diet is a vitamin-nutrient-fortified food and treat, all-in-one! 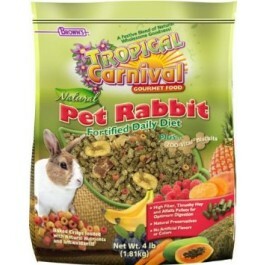 This super premium gourmet food is specifically formulated for the daily dietary needs of Pet Rabbits and is jam-packed with a medley of delicacies including pineapple and papaya. It also helps stimulate the natural foraging instinct to help relieve cage boredom. It’s simply a natural fit! A Balanced Diet for Pet Rabbits! 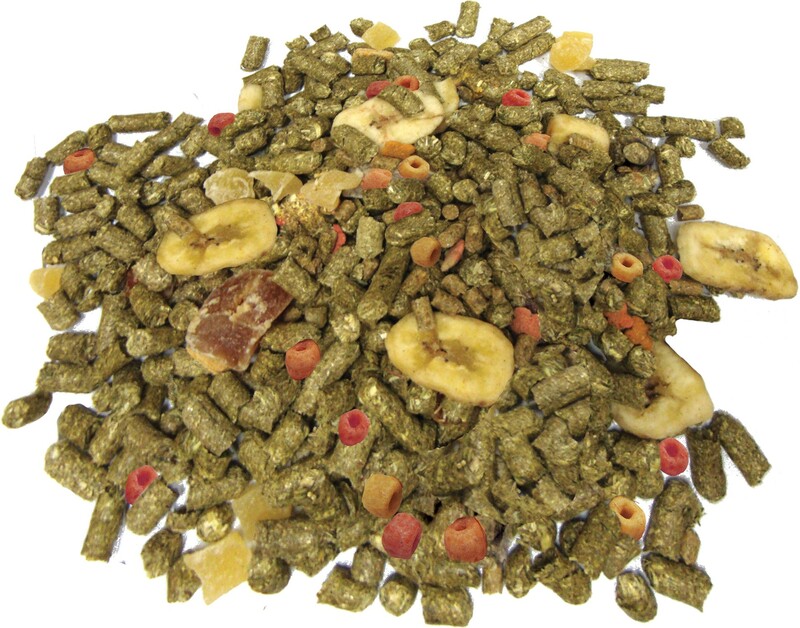 • Hay Pellets: A blend of Timothy and Alfalfa Hay is formulated for high fiber and digestibility. • ZOO-Vital® Biscuits: Each natural biscuit contains the vitamins and nutrients required for the overall well-being of your pet. Beneficial bacteria have been added to support good digestion. • Baked Crisps: Made with super fruits and veggies rich in antioxidants. • Fruits: Pineapple and papaya add fiber and essential enzymes for optimum digestibility. Ground Timothy Hay, Dehydrated Alfalfa Meal, Wheat Middlings, Wheat Flour, Ground Corn, Ground Oats, Ground Barley, Corn Gluten Meal, Dehulled Soybean Meal, Rice Flour, Dehydrated Ground Raspberry, Dehydrated Ground Blueberry, Dehydrated Ground Strawberry, Dehydrated Ground Peach, Dehydrated Ground Apple, Dehydrated Ground Pineapple, Dehydrated Ground Banana, Dehydrated Ground Carrot, Dehydrated Ground Sweet Potato, Soy Oil, Dicalcium Phosphate, Brewers Dried Yeast, Cane Molasses, Calcium Carbonate, Algae Meal, Fructooligosaccharide, L-Lysine, Salt, Vitamin A Supplement, Vitamin D3 Supplement, Vitamin E Supplement, L-Ascorbyl-2-Polyphosphate, Thiamine Mononitrate, Menadione Sodium Bisulfite Complex, Vitamin B12 Supplement, Choline Chloride, Manganese Proteinate, Iron Proteinate, DL-Methionine, Zinc Proteinate, Sodium Selenite, Dried Bacillus subtilis Fermentation Product, Dried Aspergillus oryzae Fermentation Product, Dried Lactobacillus acidophilus Fermentation Product, Dried Lactobacillus casei Fermentation Product, Dried Bifidobacterium thermophilum Fermentation Product, Dried Enterococcus faecium Fermentation Product, Dried Aspergillus niger Fermentation Product, Biotin, Folic Acid, Lecithin, Mixed Tocopherols (a preservative), Yucca schidigera Extract, Rosemary, Carotene.